Contrary to popular belief, librarians do not get to do much reading on the job. Unless you count browsing picture books, trying to determine which ones will hold everyone’s interest and next week’s Toddler Time, I’ve spent exactly 0 hours reading at work. But I still managed to surpass my goal to read 80 books this year (and then some). I read on my lunch break; I read while I’m cooking dinner and waiting for water to boil. I even listen to audiobooks when I’m driving. If you think hard enough, there’s always a way to squeeze a chapter in at some point throughout the day. Sometimes it takes me a few hours to finish a book, and sometimes it takes me a few weeks. I’ve learned not to force myself to keep reading books that don’t interest me, and that means I love most of what I read. This is the second and final installment of Bardugo’s Six of Crows duology. It’s a young adult fantasy novel, about a group of teenage thieves who get caught up in international intrigue. I enjoyed the first book, but this one had me really invested in the fates of the six main characters. Another YA fantasy novel, I think I checked this book out at least 4 times before actually getting to read it. It’s about Alex, a teenage bruja with powerful magic that she wants nothing to do with. So on her sixteenth birthday, she does a spell to make it go away, only to banish her entire family to the underworld, where she must travel to retrieve them. This is the first book in the Brooklyn Brujas series. Sometimes travel guidebooks can be more than a little overwhelming. With tiny print, minimal pictures, and dozens of sites/restaurants/shops/hotels per page, it’s enough to make my head spin. This book isn’t like that. 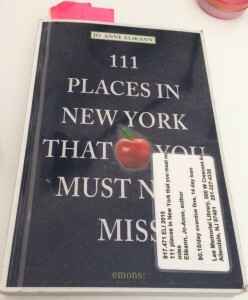 It covers only 111 places in New York City, from tourist sites and museums, to public art and shops. Each place gets a one page description, and the opposite page has a couple of large full-page color photographs. Of the 111 recommendations, I bookmarked more than a third. In the wake of Charlottesville, I wanted to read something that discussed the racial divide in America from the black perspective. A podcast I listen to recommended this book for just that occasion. I read half of it and listened to the other half on audio, which Dyson narrates himself. Told in the format of a sermon, Dyson educates white people on the difficult truths about the role we’ve played in enabling racism in America, and what actions we need to take to help end it. I cannot recommend this book, specifically the audio version, highly enough. Literature is full of stories about children who pass through portals into magical worlds. Some stay forever, but many are sent back to our world before they reach adulthood. This series explores what happens after children who have been forever changed by a magical world are sent back to our mundane one. It’s a unique topic, and an incredibly engaging one. Each of these books is short, under 200 pages rather than a full novel, and McGuire manages to pack more worldbuilding and story into them than a lot of books 4 or 5 times their size. The first two books (Every Heart a Doorway and Down Among the Sticks and Bones) are out now, while the third (Beneath the Sugar Sky) will be released in January. I’m running my first marathon at the beginning of October, and I needed something to motivate me through that last, hot, long training runs. I thought the audiobook version of this would do just that. This book follows Becky Wade a recently graduated NCAA runner, as she spends a year traveling the globe checking out the running culture in a variety of different countries. From diet to training regimen to the structure of each country’s running organizations, Wade tries to experience everything the world has to offer and then incorporate it into her own training. I’m hoping I’ll be able to finish this before my race on October 1st. There’s nothing I love more than a good fantasy novel. And as far as fantasy novels go, I rarely hear as much unilateral praise as I have for Sorcerer to the Crown. Zacharias Wythe is a freed slave who has recently earned the title of British Sorcerer Royal, following the death of his adoptive father. But with the flow of magic from Fairyland into Britain having slowed to a trickle, many of his fellow Unnatural Philosophers have turned against him. On his way to attempt to reverse this problem, he encounters a woman with immense magical power at a women’s boarding school where gentlewitches learn to suppress their magic. Together, the two set off down a path that will alter the nature of sorcery in Britain and the entire world. I read Doughty’s first memoir, about her time working in a crematory, and it gave me a lot to think about. In this newest book, to be released at the beginning of October, Doughty travels the world to observe how different cultures take care of their dead. Doughty feels that Americans have distanced ourselves too much from the dead, and is looking for a way to bridge that gap in her own practices as a morticians. I’m only a couple of chapters into this, but I think it will give me a lot to think about. Have you read any of these titles? What did you think of them? And what have you read, and loved reading, lately? I’m always looking for new addition to my TBR.